The winter nets this year we went to new venue at the Littlehampton academy school, from 15th Feb for eight weeks. Sessions for the Colts were followed by the Adults. A Very successful and well attended Club Quiz Evening was held on Saturday 28th October at the Village Hall - thanks to Craig for organising. End of season workparties took place on 8th and 15th October, thanks to everyone who supported work on and off the field. Club Social and quiz was held on Friday evening 28th April at the Village Hall, Thank you to over 100 people who attended and helped us raise funds. Workparties at the ground to prepare for the new season, were on Sun 2nd and 9th April. Indoor Nets for Colts and Adults were held at Arundel Castle Academy - During Feb and March for six weeks. The AGM was held on Sunday 29th January 2017 at the Henty Inn. Buffet and awards night was held at the Henty Arms on Friday 25th November 2016- award winners, club and individual playing Stats for the 2016 Season will listed shortly. End of Season Workparties at the ground on Sun 25th Sep, 2nd & 9th Oct 2016 10-12am. Club Quiz and Picnic Evening held on Fri 1st July 2016. Club Rounders social match held on Friday 10th June, 20+ people took part. New kitchen fitted 3rd June 2016, mostly funded via a EWCT small grant. Colts training sessions on Friday evenings, contact Rob or Lisa for details. 2016 Fixture cards are available. See the Captains or the Committee for your copy. Successful first Colts Net session held at Arundel Castle Academy on 10th April 2016, followed by the last Adult Net of the winter. Annual Jumble Sale took place at the Village Hall on Sat 19th March - thank you to everyone who supplied Jumble and to those who helped before and on the day to raise much needed funds for the club. Workparties were held at the ground Sun 20th March, 3rd & 10th April 2016, thanks to those who helped. Indoor Nets at Arundel Castle Ground Academy held mid-Feb 2016 to early April. AGM held at the Henty Inn, Sunday 31st Jan 2016. 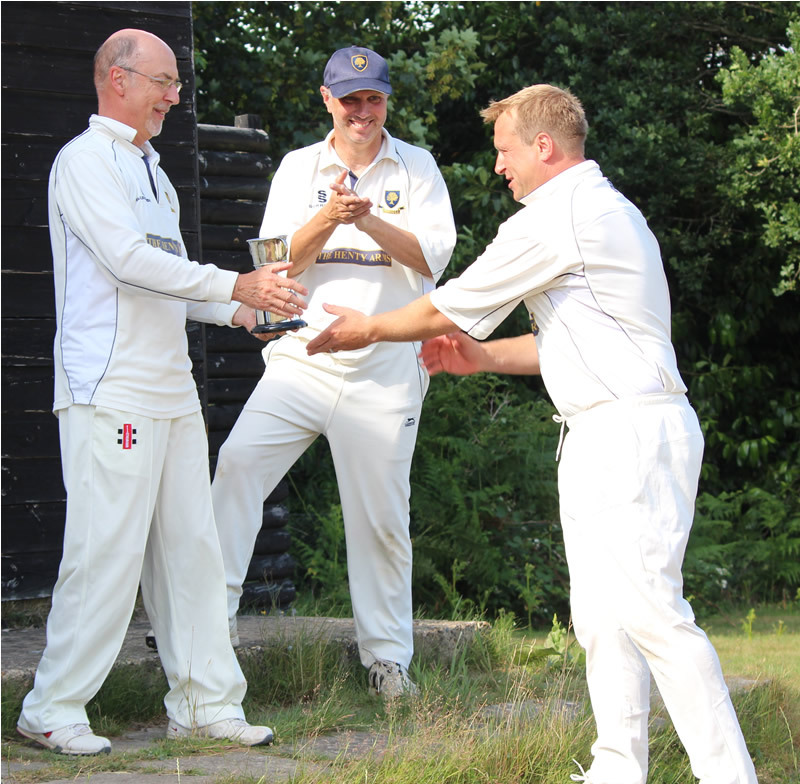 End of Season Cricket Dinner and Awards evening held on Friday 27th Nov 2015 at the Henty. End of season social - Curry evening Fri 16th Oct.
End of season Workparties at the ground 10-12am on Sun 27th Sept , 4th & 11th Oct.
STOOLBALL COMPETITION was held at the LITTLE TWITTEN, Sunday 16th Aug.
Presidents Match vs Ferring CC Sunday 26th July 2pm - unfortunately canceled due to rain. Social get together and Quiz took place Friday 3rd July 6:30 pm at the Pavilion. Rounders and Social was held at the Ground on Friday 5th June. Annual Jumble Sale was held at the Village Hall on Sat 14th March - thank you to everyone who helped or visited and helped to raise much needed funds for the club. Indoor Cricket Nets held again at Arundel Castle Ground Academy between Feb and April 2015. Our AGM was held on Sun 1st Feb 2015. Workparties at the ground on 28th Sep, 5th & 12th Oct 2014 10am. Jumble sale was held at the Village Hall Sat 12th April 2014. AGM held on 26th Jan 2014 10am at the Henty. AGM held on 27th Jan 2013 at the Henty. Over 40 members and guests attended another excellent dinner and awards evening. Rob Miller our Chairman gave an overview of the year including the impact the weather had on matches arraigned/played and also the successful competition of the Sport England funded pavilion improvement project. A special presentation of an engraved shield was made jointly to Rob Miller, Ian Edwards and Ivan Salter for their magnificent efforts to pull together the Sport England application and to deliver the project on-time and to budget. Terry and Mark gave their review of the Sat and Sun teams' performance for the year. There was a raffle on the night which was well supported and will help keep the club afloat over the winter. A list of awards, those who won, along with a copy of the Statistics for the club year will be posted on the web site soon. Announcement from our Chairman, Rob Miller, January 2012. In addition the award covers the cost of providing a new mower for the square, an outdoor batting practice strip and a mobile net surround meaning that for the first time for many years members can enjoy outdoor net practice at the ground. After a tender and selection process West Sussex contractors Hadley and Hall were appointed and work commenced on the 30th January this year. Work completed on Friday 9th March, the club are looking forward to offering better changing facilities, outdoor cricket nets and coaching to existing and new members of all ages. Over 40 members and guests attended another excellent dinner and awards evening. Rob Miller our Chairman gave us update on our application (autumn 2011) for a grant to improve the pavilion. He also gave a review of the year. Andy, in mike's absence, and Craig gave their review of the Sat and Sun teams' performance for the year. A new Cup was presented to the club by Peter Bromley and Alan Francis in memory of Bill Austin - a stowart of the cub for many years including being chairman, secretary , evening league organiser , groundsman assistant and generally the nicest most reliable person you would every want to have around a cricket club. He tragically died a few years ago and we thought it fitting the BILL AUSTIN MEMORIAL CUP for FIELDING should be awarded from this year on. There was a raffle on the night and the proceeds have gone towards our application for a grant for major pavilion improvements. We had another very successful Jumble sale with the support from the community and members of the club. Thanks go out to everyone involved before and on the day. This is our primary pre-season fundraiser and we had a very good result again, which enables us to start the season on a sound footing. We held nets again on Wednesday mid evenings from 16th Feb until 13th April at possibly the best nets available to village Cricketers in Sussex. This was the fifth year we have managed to secure 8 weeks of nets for current and new players to the club, please contact the committee for details. Our thanks go to John Barclay at Arundel Castle Cricket Foundation for making the nets available again. This took place on Sunday morning 23rd January 2011 at the Henty. There were around 15 members and VP's present. The usual agenda format was followed with reports from the current officers and election of officers for the new season. Playing Statistics for the 2010 season along with the draft fixture list for the forthcoming Season were issued. A list of new officers will be added to the site shortly. This took place on Friday 26th Nov 2010 at the Henty. Our Chairman, Rob Miller presented the annual awards and trophies. There was a good turn out and we had the whole of the public bar area to ourselves. The recipients of the Awards will be published on the News page soon. On a day when the FCC Sunday side were winning away to Brunswick Village, the ground was used to host for the second season a Sussex Ladies limited over match. There was a great attendance from the public and families of both teams along with ECB and county coaches, umpires and scorers. A 21 yard pitch was prepared along with a 40 yard boundary. Members and VP's of the club and the public attended the match. The weather was very good if a little breezy this year, the match took place between between 2 and 6pm. We decided to improve the facilities before the start of the season by providing another toilet within the pavilion. This involved some redesign of the interior layout, new internal walls and plumbing etc. The work was done by a couple of committee members and funded in the short term via a loan by a member of the club who we are grateful to, as funds were particularly low over the closed season. We managed to negotiate very favorably terms and prices as part of the NATWEST Cricket force 2010 initiative from several local suppliers. Our hope is that the additional advertising in the fixture card will fund this work and that members will benefit from these facilities. We had another good supply of Jumble from the local area this year and with support from the community and members of the club we had another successful event. Thanks to everyone before and on the day for their support. Thanks to Splash FM and to the Worthing and Littlehampton Herald group of paper's for advertising the event. Wednesday mid evenings from 24th Feb until 14th April at possibly the best nets open to village Cricketers in Sussex. This is the fourth year we have managed to secure 8 weeks of nets for current and also to introduce new players to the club. The annual end of season Workparties took place on Sunday 27th Sept, 4th, 11th and 18th October 10 to 12 am. Support from the club was variable but we got the work completed in the mainly good weather. We have been lucky to again have access to some additional ground equipment which helped with the square renovation. The following week we put up the perimeter wire. The rest of the time was used to paint the metal shutters/doors and replace the gable ends which needed plastic capping to make them weatherproof. On a day when the FCC Saturday side were playing away at East Brighton Park, the ground with the permission of ADC was used for a Sussex girls limited over match. There was a great attendance from the public and families of both teams along with ECB and county coaches, umpires and scorers A 21 yard pitch was prepared along with a 40 yard boundary. The weather was kind to us and a full match took place between 2 and 5pm, Kent eventually won in the last few overs of a closely balanced match after putting on 124 batting first. "I would like to thank you for letting us use Ferring Cricket Club on Saturday, it was a great setting and I had some great comments from many parents, it was just a shame we lost. Once again thank you for all the preparation before the day and the support you gave us on the day"
Workparties were held on Sunday 29th March and 5th April to work on the ground and the pavilion. We had help from club members on both Sundays as well as work at other times on the interior of the pavilion. A supply of NATWEST Cricketforce T shirts was given out to those who attend and thanks to everyone for supporting this pre-season work. There will be a write up and pictures published at a later date. We had another good supply of Jumble from the local area this year and with support from the community and members of the club we had a successful event. The fundraising was very good including donations of raffle prizes from a local supermarket which helped to swell the coffers. Thanks to everyone before and on the day for their support and we look forward to holding the same event next year. This took place on Sunday 11th January 2009 at the Henty between 10 and 12 am. All members were invited to attend to support the club and influence our plans for the forthcoming Season and beyond. The usual agenda format was followed with reports from the current officers and election of officers for 2009. Playing Statistics for the 2008 season and personal reviews were available along with the draft fixture list for the forthcoming Season. This took place on Friday 28th November 2008 at the Henty. Our Chairman Rob Miller presented the annual awards and trophies. The recipients of the Awards and the Statistics for the 2008 season are now published on the News page. For a third year. We have managed to secure Net sessions at the Castle Academy. These will be on Wednesday nights starting from 18th Feb 2009 and will run for 8 weeks through to April. The costs to players is unchanged from this year, more details can be obtained from the committee or Peter. Sunday 21st Sept 10am-12am to scarify pitch,spread grass-seed and the Surrey Loam - Peter Loaned some equipment from other Cricket Clubs that should make this easier. Saturday 27th Sept 2pm-4pm to complete Autumn renovations on the pitch and weather permitting to erect the perimeter fencing. We had a tradition over several years on Presidents day at the end of July of inviting the ROH to play a match against FCC. We hope in revive the fixture in future years, however until then here is a link to an article written by the Royal Opera House CC in 2005 including photographs taken of the match. There were two working sessions at the ground on Sunday 6th and 13th April and Cricketforce 2008 T-shirts were available for all who helped. On 6th April, five "mad" club members appeared at the ground to the sight of the heaviest snowfall in many years on the Sussex Coast. We agreed that, although far from ideal, it would really hold up pre-season preparation if We were not able to at least remove the perimeter wire and fencing from around the square. This took us a couple of hours (see the photographs on this page), but We did manage to complete the work even though We didn't see the pitch at any time ! Thanks go to Bill Isham, Peter Cooke, Terry Cutler, Rob Miller who helped me (Peter Bromley) get this work done , thanks also to Rob for supplying a flask of coffee and biscuits. Greg has been busy refurbishing the kitchen area with replacement units and We have also installed a water heater so We will have hot water on tap for washing up. After some major vandalism and a break in at the ground over the winter, We have had metal shutters designed to fit all the windows along with a replacement metal door for the ground equipment area. These were installed during March 2008 and the primer/undercoat of all the metal surfaces now been complete. The top coat will be completed hopefully before the start of the season, weather permitting ! We also have new higher security padlocks fitted on all the windows. There is still work to be done to get the pavilion back to normal but temporary repairs have been completed. The people who caused the vandalism and break-in/theft were caught and subsequently charged by the Police. Our annual Jumble sale took place on Sat morning 29th March at the Ferring Village Hall. This was very well supported by the club and by customers from the village and more widely in the area. There was a large amount of good quality clothes, books/toys, bric-a-brac and general jumble which had been collected by members of the club during the previous few weeks. We were delighted with the support and actually made more income that We did last year (which was in itself a very good year) so making this are best year for a long time . Thank you to everyone involved. Changes to the Committee : Ian Edwards and Chris Harris have retired from Chairman and Secretary roles, Rob Miller and Chris Daulby have taken on the respective roles. Mike Lewis and Dave Bailey remain Sat Captain/Vice Captain. Greg Dean has retired from Sunday Captain and been replaced by Mat Sealby with Peter Cooke taking on the Vice Captain role. We have secured for a second year, Thursday evenings during February and Tuesday evenings in April 2007 at probably the best indoor nets in Sussex. Details can been obtained from any of the Committee. An additional session was arranged for 27th March. This took place on Friday 30th November 2007 at the Henty. Our Chairman and MC for the night was Ian Edwards who provided his witty observations on the year on and off the field. He Also presented the annual awards and trophies. The recipients of the Awards and the Statistics for the 2007 season are on the News page. We had Workparties at the ground, Sunday mornings @ 10am on 30th Sept and 7th October. This was the usual autumn pitch maintenance work followed by the securing of the square perimeter fencing. We have started work on preparing the kitchen for the recently donated kitchen units. We will Also be installing new flooring and a hot water heater for the sink. Ferring CC is very sad to hear that Dave White died whilst playing in a Chippingdale match on Sunday afternoon, 29th July 2007. The news was brought to us during our Presidents match held at the Little Twitten. The Worthing Herald has subsequently run articles on Dave's long-standing involvement in Cricket and other sports in Sussex. The paper has published a long list of tributes and details on the funeral which was held on Wednesday 8th August at 3pm at West Worthing Baptist Church, South Street, Tarring. Dave was a very valued friend and colleague to many members of Ferring and Also Highdown Cricket Club, he will be sadly missed. The Annual Chippingdale Vs Ferring match was switched location as a mark of respect to Dave and was held at the Little Twitten on Sunday 12th Aug.
We were delighted to be asked to play play our third match since 2000 at the Castle Ground. The match was against Arundel Grasshoppers (formally Castle Estate) . The weather was kind to us again and a low scoring but closely fought match was held, the grasshoppers eventually winning by a no-ball on the last ball of the match. The Fixtures for this Season are now available on the Fixture Page, the fixture cards are now printed and are available from Ian Edwards or the Captains. After five very successful nets at the academy which started in March 2007, an average of 18 players have attended and it was decided to extend to a sixth and final net on 10th April 2007. The start time has had to be changed so please contact the organiser if you want more details. We have Also been very pleased to welcome five new prospective players to the nets. Pictures of the Cricketforce 2007 weekend (30th March - 4th April) have been added along with a brief report of what was achieved. There was a very good turnout, especially on the Sunday and a great deal of work was achieved. Thanks go out to the membership, Arun Mowers and Travis Perkins for their support. Photo's of the 2006 Season Saturday matches have now been added to the pictures page . Due to the 500+ digital photographs available, this has taken sometime in editing. Club Statistician , Peter Bromley, has entered the results of the last 10 years records from the score books into a statistics package. The results of this analyses was distributed at the AGM on Sunday 28th Jan 2007 and is Also to be found here. Club treasurer Terry Cutler was interviewed concerning Southern Waters decision to remove the sprinkler ban on 18th Jan 2007. The BBC originally interviewed FCC in Spring 2006 when the ban was first imposed. There was, at the time, a threat of a draught order which would have had significant impact on all grass sports. The recent BBC programme gave a brief history of the issue, an extract of the original interview held at the ground with Terry and they were interested in our views of the impact of the water restrictions on sport during 2006. FCC was very sad to announce that Rob Goacher died suddenly, aged 50, on 7th Nov 2006 whilst in Hospital. The funeral was on 24th November at Worthing Crematorium and was attended by several hundred people, including many current and previous club members. We have secured Tuesday mid evenings during March and April 2007 at possibly the best nets open to village Cricketers in Sussex. In the past We have held nets at various locations with the aim of honing our cricket skills during the winter and Also to introduce new players to the club. If you would be interested in attending any of the sessions and joining the club, you would be most welcome - please contact us Here for details. There will be a charge for the nets. Our thanks go to John Barclay at Arundel Castle Cricket Foundation for making the nets Available. An article titled "Team of the Week - Ferring Cricket Club" appeared in the Local Worthing Herald Newspaper on 7th Sept 2006. This consisted of a photograph of the Saturday side taken at the home match Vs Brighton & Hove Crescent and an article on our part in the vitality of Village Cricket. A reproduction of the Photograph and article may be added here later. Photo's of the 2005/2006 Season matches are being added to the pictures page . Due to the sheer number of digital photograph , these are taking some time to edit down to a manageable number. Thanks go to Ivan Salter for the 2006 Sunday XI match photo's. This year We scarified the square, repair the last couple of pitches, applied grass seed/Surrey loam and erected the perimeter fencing. These work parties took place at the ground on Sundays on 24th Sep, 1st, 7th October. Thanks to those few members of the club who leant a hand, the essential work was completed by early October. If there are sufficient numbers attending on subsequent Sundays then We Also plan to complete the tidy up of the inside and outside of the pavilion. This was held at the Henty on the evening of Friday 24th November 2006. Workparties were organised for 14th & 15th September to remove the temporary paneling, replace the posts and create new balustrades for the front of the pavilion. Pictures of work performed over the two days can be found HERE, thanks to all those involved and to Travis Perkins for supplying and delivering the materials used. We have been hosting matches against Arundel Castle Estate CC since 2000, however We were delighted with the opportunity to visited Arundel Castle Cricket Ground in April 2001 for an away fixture. Unfortunately the match was rained off - the curse of early season matches. In 2002 We were fortunate to have another chance to play at the magnificent ground Although the weather was overcast with light drizzle, We managed to complete the match. In 2005 We were again offered an away fixture on Saturday 7th May and were blessed this time with good weather and a very good match. Jason White (Saturday XI) for gaining excellent grades in his A levels which now allow him to go to his university of choice in September. Mark Isham (Saturday XI) for gaining an honours degree in Mathematics. Mark is now having a gap year before starting his postgraduate teacher training. Sarah Bromley (Younger daughter of Peter Bromley) for gaining an honours degree from the university of Northampton in Sociology and Psychology. Congratulations to Mike Lewis (Saturday Captain) for getting married during August 2006. Additional information may be added if Mike is prepared to spill the beans on events before/during and after the wedding. Ferring Cricket Club Web presence was launched on www.ferringcricket.co.uk on Monday 21st August 2006. The new website is hosted by Haylingpages.co.uk for a peppercorn rent and the domain site is registered via Gradwell.com again at a much reduced biannual rate. Visitors who attempt to contact the old website (www.ferringcc.fsnet.co.uk) will be redirected to this site within a few seconds. The Opera House CC returned for the 3rd successive year to Ferring on Sunday 30th July 2006 for another match to celebrate our presidents day. A review and pictures of the match will be posted at a future date. Annual dinner and awards held on Fri 30th Nov 2012. Sport England Cheque handover ceremony 4th May 2012 with Sir Peter Bottomley MP. Club Improvement funding application approved Dec 2011 - Building work started Feb 2012. AGM held on 22nd Jan 2012 at the Henty. Annual Dinner held on Friday 25th Nov 2011. FCC 60/70/80's Dance held at the Henty 8th July 11. Sussex CCC venue change to Ferring for U13 ladies match Sun 22nd May. AGM 23rd Jan 2011 held at the Henty 10am. Dinner and Awards 26th Nov 2010. Summary Here of Annual General Meeting held on Sunday 17th Jan 2010 at the Henty. 2009 Club and individual statistics published. End of Season workparty's at the ground: Sunday 27th Sept, 4th, 11th and 18th October 10 to 12 am. NATWEST Cricketforce Workparties took place on 29th March and 5th April. Annual fund-raising event: Jumble Sale at Ferring Village Hall 10am-12am Sat 21st March. Nets at Arundel castle held between Feb and April 2009. 2009 AGM held at the Henty 11th Jan 2009. 2008 Club and individual statistics published. Annual Dinner and Presentation evening (28th Nov 08) Awards Listed on news page. End of Season Workparties at the ground. Nets Booked at Arundel Castle Academy School for Feb-April 2009. Presidents XI Vs Ferring cc Sunday 27th July 2008. Royal Opera House Vs Ferring CC - Report and pictures. NATWEST Cricketforce 2008 groundwork 6th and 13th April. Very Successful Jumble Sale at the Village Hall. At popular demand, a sixth week booked for nets at Arundel Castle Cricket Academy.